A freight truck leads the way down Interstate 70 near Avon on Wednesday. According to models created by Colorado Department of Transportation planners and consultants, by the year 2025 big trucks will account for 4 percent of all vehicals on the Denver/Silverthorne segment on I-70 on weekends, and 6 percent during the week. The Colorado Motor Carriers Association and Vail leaders have entered into a “multi-faceted approach” toward reducing noise on the stretch of Interstate 70 that runs through town. “We want to work with the community and wind up with something that better serves the community,” Greg Fulton, the association’s president, said Tuesday after the Vail Town Council agreed to delay until March 16 any action on Ordinance 28, which would have banned the use of engine-compression brakes, also known as “jake brakes,” in town. 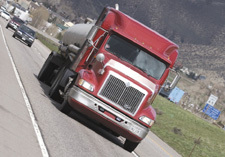 The memorandum of understanding is a victory, of sorts, for the trucking industry, members of which have said Ordinance 28 would have singled out truck drivers unfairly when much of what comprises highway noise comes from other vehicles, such as motorcycles, as well as rogue trucks without proper muffling systems. “This agreement is a good opportunity for the town to look at a wide variety of noise issues, things way beyond what our industry is responsible for,” said Fulton. The seven-member council, by a vote of 5-1 – Councilwoman Diana Donovan was opposed and Councilwoman Kim Ruotolo was absent – has been working on passing the ordinance since September, when its members instructed the town attorney to draft an ordinance banning the use of jake brakes. This came nearly three years after council members vowed to do something about the noise generated from traffic on the freeway running the length of town. “I look to you to give comfort to us we’ll have less noise,” Moffet said. Key to Zemler’s plan is a year-long pilot program involving the Colorado State Patrol. In an initial media campaign, Vail police will begin a four-month program of traffic stops “with an educational component” consisting of warnings; after that, the police will “transition to a more restrictive phase,” including citations, which could approach the maximum allowable fine in Vail of $999. Quarterly reports would inform the council as to the pilot program’s progress. I-70 descends about 500 feet in altitude from East Vail to West Vail, with another 500-foot drop coming before Eagle-Vail. The smell of asbestos brake pads and the sight of truck brakes smoking – or even on fire – are a relatively common sight, and runaway truck ramps are a feature of the local landscape. Truckers say they often use “the jake,” named for the Jacobs Engine Brake, trademarked by Jacobs Vehicle Systems, to supplement the use of their wheel brakes – especially on long, downhill grades. Typically, a trucker negotiating Interstate 70 westbound turns on the jake brake at Vail Pass and leaves it engaged well past Vail – perhaps all the way to Avon, Edwards or even Eagle, they say. The noise most people associate with “the jake” actually occurs when the trucker lifts his foot off the gas pedal, sending compressed air into the engine’s cylinder heads and turning the engine into a power-absorbing air compressor, they say. Donovan has been against adopting Ordinance 28 all along, saying the issue is more about safety than noise and that enforcing the speed limit on I-70 through town, 65 mph, would do far more to increase safety – and reduce noise – than trying to ban the use of jake brakes. And indeed, noise studies have shown various other components of highway noise – tires rolling on the surface and wind flowing around vehicles – increases dramatically with speed. As part of the deal Tuesday, the Town Council agreed to fund the expense of another officer for Vail Police Department, which for the first time in the town’s history will be enforcing the speed limit on I-70. Police Chief Dwight Henninger estimated in September another full-time officer’s position needs to be filled at a cost of $46,000 a year. He said that will pay for about 21 hours of week of speed enforcement duty, which will be rotated among various members of the force. Soon, perhaps, Vail squad cars will be seen on I-70, with officers using radar guns to identify, stop and fine speeders, be they truck drivers or other motorists. And someday, perhaps soon, they’ll be using decibel meters, too, to identify, stop and fine violators of the town’s sound code.